Developed to be the optimum sized exhaust valve size and shape to fit in small-bore A-series cylinder heads for bore sizes of +0.060" and over. Made by Europes premier specialist valve manufacture for CST in EN214N steel. Seat to collet groove is correct length for all small-bore heads, so not massively thick rocker pedestal shims needed. Consequently rocker adjuster screws are not hanging a long way out of the rocker. 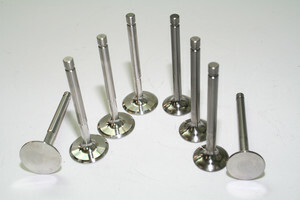 Requires bronze valve guides to be used as they are not heat treated. This is to reduce brittleness that can cause valve failure in use. On right in picture.